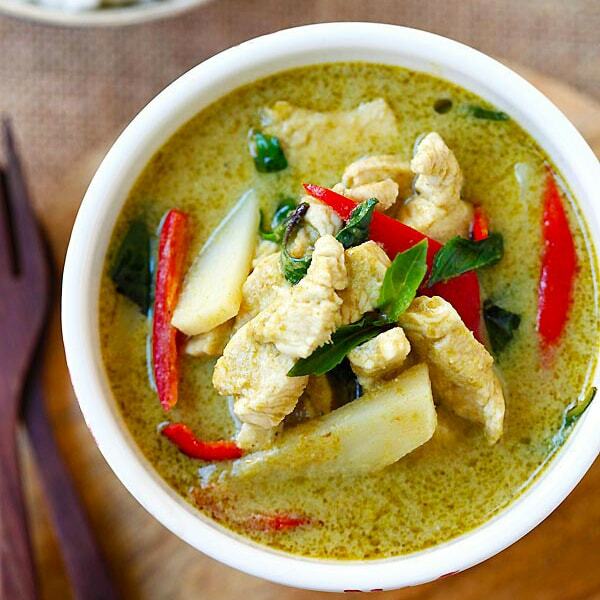 Green Curry - delicious and easy Thai green curry with chicken in rich coconut curry sauce. 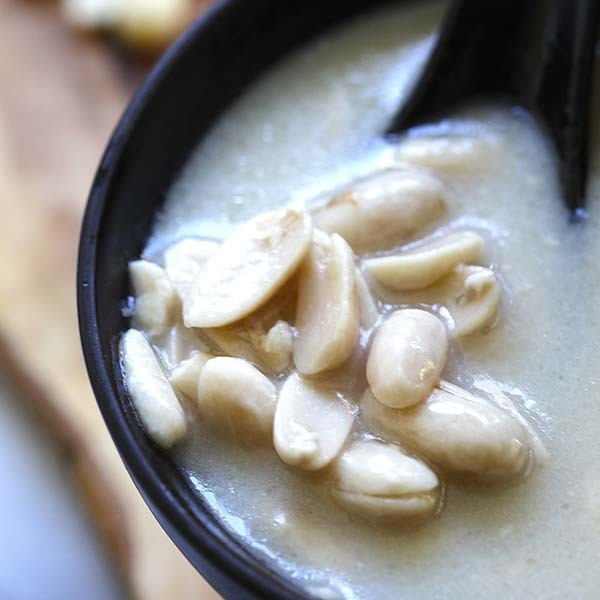 Homemade and authentic, this recipes takes 20 mins and much better than restaurants. Green Curry (Gang Kiew Wan) is one of my favorite Thai recipes. It’s spicy, aromatic, sweet and savory at the same time. Thai green curry is so delicious, specially when it’s served with steaming white rice. If you love Thai food, I am sure you know Thai curries, named after the color of the curry paste used to make the curry: red curry, yellow curry and green curry. There are also Panang curry, Jungle curry, Massamam curry, etc. Curry paste is traditionally made by pounding the ingredients in a stone mortar and pestle until all ingredients become a fine texture. I usually use instant curry paste from Asian stores, for example: Maesri brand Green Curry Paste. You can make very good, authentic and absolutely delicious curries using store-bought curry paste. The key is to balance the flavors—it has to be spicy, rich and creamy (from the coconut milk), savory (from the fish sauce) and sweet (from palm sugar or sugar). 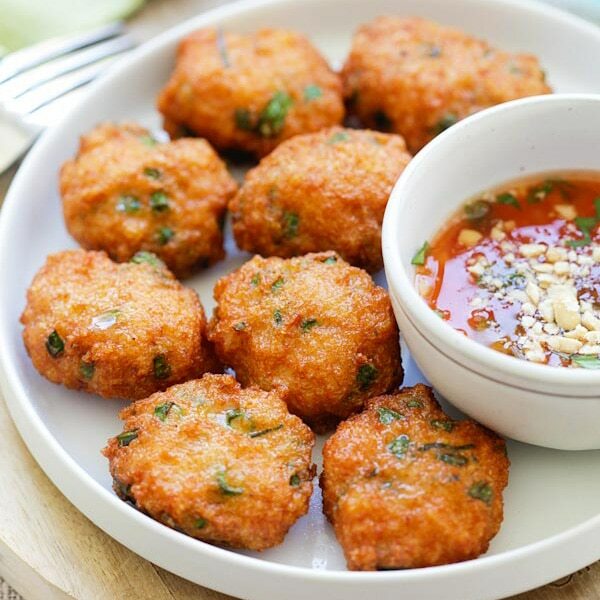 Sweet, sour, salty and spicy are the four pillars of Thai cuisine; once you master the perfect balance, you can make just about any Thai food at home! What is the difference between red and green curry? Other than the color, the difference is the main ingredient used in the curry paste. Red curry uses dried red chilies, hence the red color. How Do You Make Thai Green Curry Chicken? 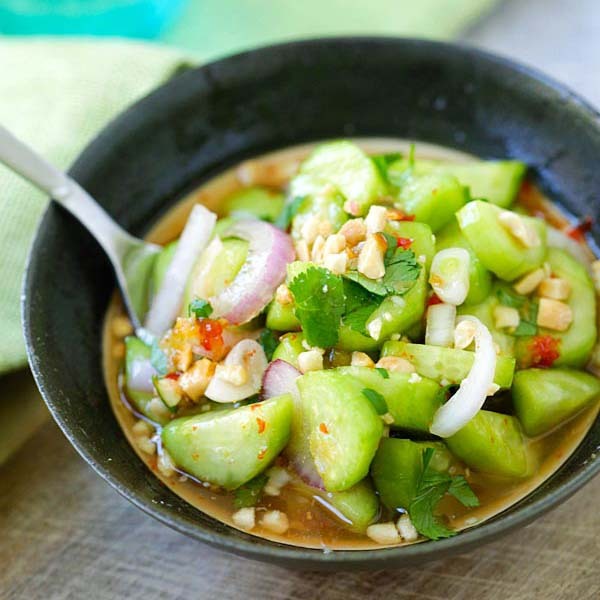 Green apple eggplant or Thai eggplant, which is a variety of eggplant which is small and round in shape and used in Thai cooking. They are sometimes available at Asian stores but not often. I opted out and used canned bamboo shoots, which are widely used as a replacement in Thai restaurants in the US. First, saute the curry paste and then add the chicken. Add the coconut milk, water, bamboo shoots, and all the seasoning ingredients. Cook until the chicken becomes tender and the green curry sauce is slightly thickened. 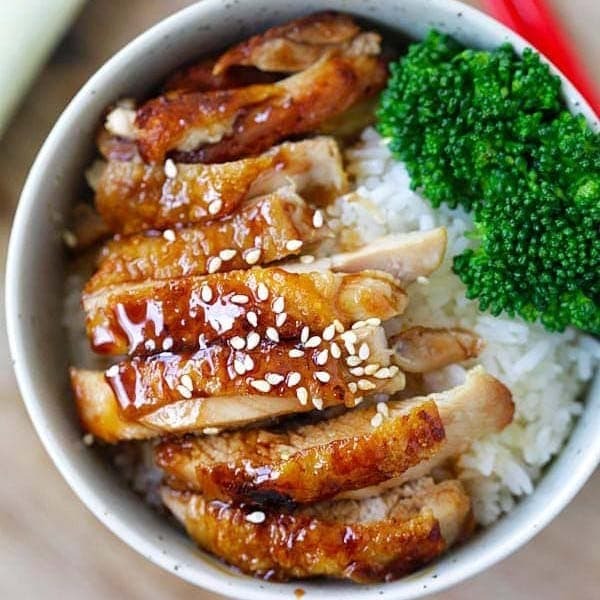 This meal is best served with steamed rice, preferably Thai rice. 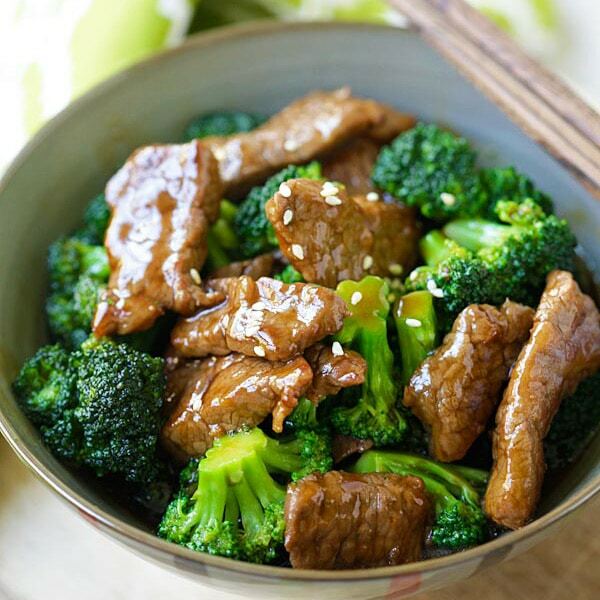 For a wholesome meal and easy weeknight dinner, I recommend the following recipes. Heat up a pot over medium heat and add the oil. Saute the green curry paste until aromatic, add the chicken and stir to combine well with the curry paste. Add the coconut milk and water and bring it to a quick boil. Add the bamboo shoots, kaffir lime leaves, and red chilies. Lower the heat to simmer, cover the pot and let simmer for 10 minutes or until the curry slightly thickens. Add the fish sauce, sugar, and basil leaves. Stir to mix well. 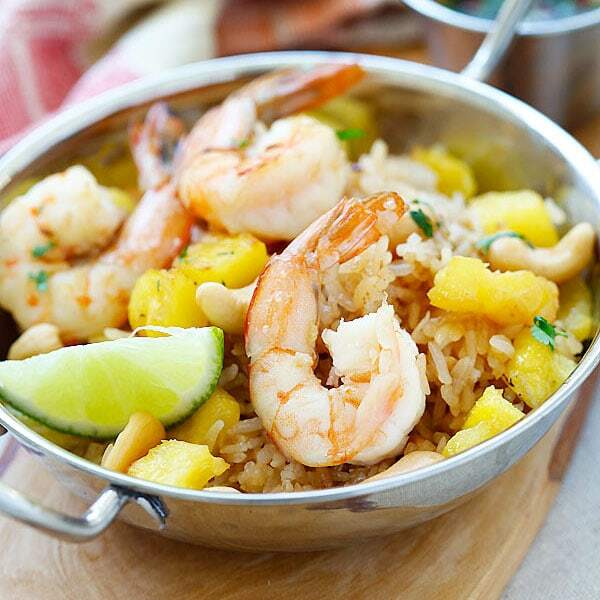 Turn off the heat and serve immediately with steamed rice. Can you provide quantities for all the ingredients of your chicken green curry recipe, please? Yes, the recipe is at the bottom, did you scroll down??? 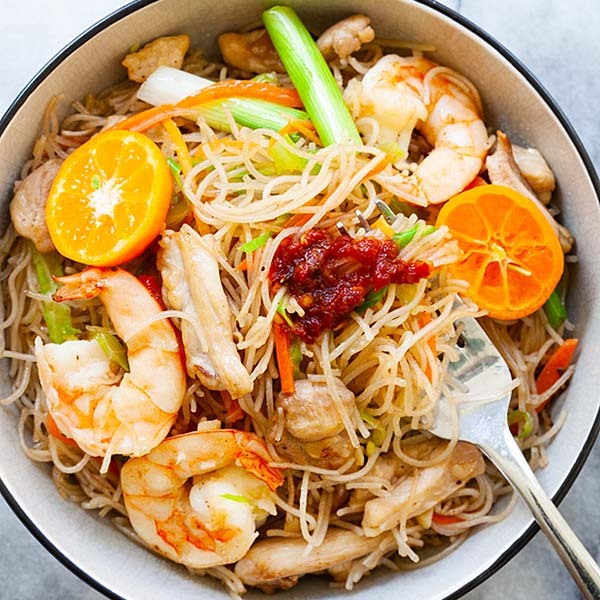 I absolutely loved this recipe, and so did my husband, but I personally found it a little too spicy (though my husband did not)! I know that green curry is traditionally spicy, but I’m curious if there is a way to make it a little less so? I followed the recipe exactly, and even found the Maesri green curry. Is the spice in the paste or in the red chili’s? Thank you! Hi Teresa, you can cut down the green curry paste a little bit if you want it less spicy. It’s made with green chilies, which could be spicier than red chilies. Absolutely LOVED this recipe! Thank you for sharing it! Hi Ruby thanks for trying my green curry recipe! what happened to the eggplant? You included it in the first “sort of” recipe but not in the “final “recipe. Why tell us about the eggplant but not put it in, especially since it is an essential ingredient? What do you mean first sort of recipe??? I never put eggplant in my green curry recipe. You can add eggplant, we can’t find the round small eggplant here in the USA. I want to try your recipe. It looks scrumptious. The red Chili… is that a hot Chili or the sweet red bell?